What happens with a man when the divine materializes and grabs him? Is it so simple to handle your own doubts? Is it so unforgivable to have them? Which is worse – to have or not to have them? If one cannot survive without God, then how can one survive with Him? Nine almost biblical stories which ask the questions. But whose questions are these? And who is the one behind all that? Elena Alexieva was born in 1975 in Sofia. She majored in International Economic Relations at the University of National and World Economics in Sofia, and continued her studies in the Doctoral Program in Semiotics at New Bulgarian University, Sofia. She is the author of two poetry books, Ladder on the Heart (1994) and Face of Killer Angel (1996), one novel – The Blue Stairway (2000), and two collections of short stories, Readers’ Group 31 (2005) and Who (2006). Her works have appeared in a number of periodicals and anthologies, including Voices from the Faultline: A Balkan Anthology (2002). 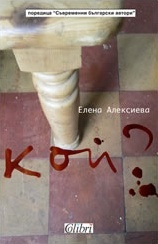 She is the winner of the 2006 Helikon Prize for new Bulgarian fiction for her book Readers’ Group 31. Her latest book is the novel The Knight, the Devil and Death (2007, Colibri). Elena Alexieva lives in Sofia where she works as freelance translator, interpreter, and writer.